The two episodes that make up "The Best of Both Worlds" are among my favorite of Star Trek: The Next Generation. When they're on TV like yesterday on BBCA I'll usually watch. Yes, there are spoilers ahead if you haven't seen it. I was one of the millions of people waiting anxiously through the summer of 1990 to see how the cliffhanger would be resolved. Fortunately I was able to see Part 2 before shipping out to Saudi Arabia for Operation Desert Shield that fall. Why does that bit of personal history matter? Because it affects how I look at Starfleet. Yes, Starfleet prefers to downplay its military role but it is still the military arm of the Federation charged with the protection of Federation personnel and property. We find out early on that Riker has been offered his third starship command. When Picard talks to him, Riker says that Picard needs him, particularly now (due to the Borg threat). Picard correctly points out that Starfleet needs good captains, particularly now, and that the Enterprise will get by without him. Add into this situation Lieutenant Commander Shelby, an ambitious young officer clearly on the fast track to her own ship, much the way a younger Riker was. She challenges him a few levels and makes him think about why he's still on the Enterprise. 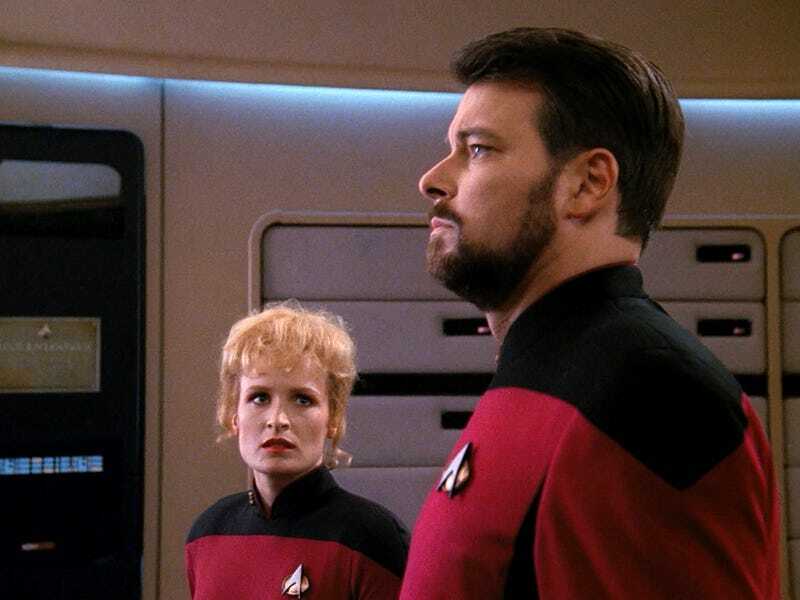 Riker: When it comes to this ship and this crew, you're damned right I play it safe. Shelby: If you can't make the big decisions, Commander, I suggest you make room for someone who can. By the end of the Part 1 Riker shows he can make the big decisions though. Through most of Part 2 Riker is wearing the four pips of a captain but at the end he chooses to return to his position as First Officer. And that's where I have the problem. Obviously the show didn't want to lose a popular character so of course Riker wasn't going anywhere. But given the situation Starfleet was in at that point in time it's difficult for me to see why Starfleet gave Riker a choice. I'm fine with Starfleet having at least an unofficial Kirk Rule - they won't promote someone to admiral if they really want to be a starship captain. In First Contact, Picard is commanding his third starship. I'm pretty sure Janeway made admiral first because Picard turned down promotion when it was offered to him. But getting to the captain's chair is a different matter. Starfleet lost thirty-nine starships and almost 11,000 people at Wolf 359. Picard's earlier words about needing good captains is more true than ever. Riker's actions when in command of the Enterprise showed he was ready for his own ship. If I was in charge of Starfleet I would have told Riker to keep that fourth pip on and choose his new ship.